JBL Free wireless earbuds lead affordable headphone line-up | What Hi-Fi? 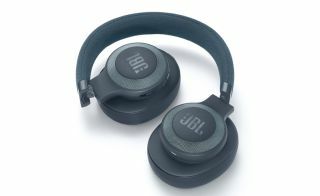 JBL has announced a number of new headphone models at IFA 2017, with the emphasis squarely on value for money. The E65BTNCs (pictured above) have an over-ear, wireless and noise-cancelling design packing Bluetooth 4.1 technology. The battery can be fully charged in just two hours, and from a full charge they'll last 15 hours in noise-cancelling mode and a full 24 hours if noise-cancelling is switched off. They're mic-equipped for answering calls, and available in black, white or blue finishes. On sale from October this year, the E65BTNCs will cost £150 a pair. The evocatively named JBL Free are wireless earbuds, Bluetooth-enabled and mic-equipped. They're supplied with a charging case, making 24 hours of playback possible from a single charge - the earbuds themselves are good for four hours' continuous use, and there's another 20 in reserve from the case. Finishes are limited to black or white. They're on sale in October, and will cost around £120 per pair. Soundgear is JBL's interpretation of the currently voguish neckband headphone design. Soundgear is Bluetooth-equipped, naturally, and JBL is keen to emphasis the deisgn's compatibility with VR headsets as well as its dual-microphone configuration for online gaming and similar. It's like a speaker for your collarbone. Priced at £200, the Soundgear is on sale from November 2017. Finally, JBL Jr is a headphone aimed squarely at younger users. The range includes wired and wireless variants, and is tuned for lower sound-pressure levels and a maximum volume level of 85dB - all good for protecting sensitive ears. And, of course, the earcups are sized for the smaller-eared user too. The wireless JR300BT will cost £40 and the wired JR300 just £20. They're on sale next month, in a variety of finishes including pink, red and blue. And they come with plenty of stickers, so owners can customise their look.